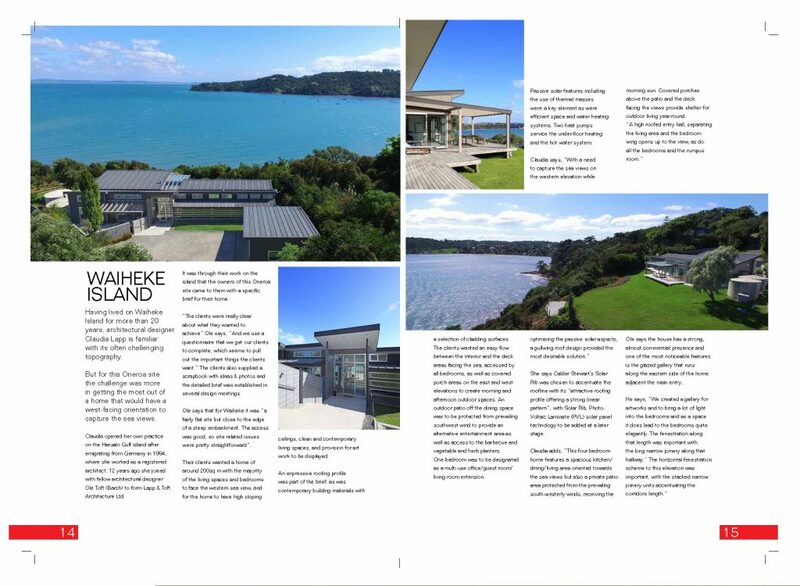 Having lived on Waiheke Island for more than 20 years, architectural designer Claudia Lapp is familiar with its often challenging topography. 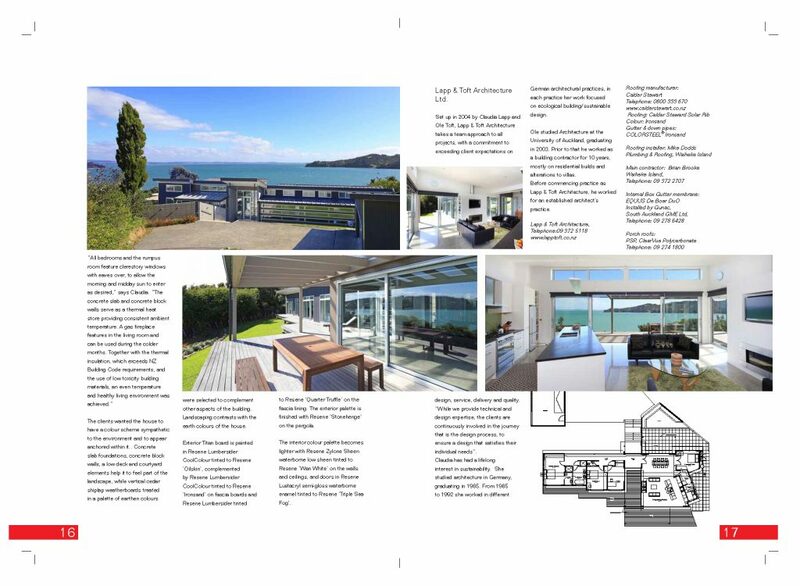 But for this Oneroa site the challenge was more in getting the most out of a home that would have a west-facing orientation to capture the sea views. Claudia opened her own practice on the Haruaki Gulf island after emigrating from Germany in 1994, where she worked as a registered architect. 12 years ago she joined with fellow architectectural designer Ole Toft (Barch) to form Lapp & Toft Architecture Ltd. It was through their work on the island that the owners of this Oneroa site came to them with a specific brief for their home. “The clients were really clear about what they wanted to achieve” Ole says. “And we use a questionnaire that we get our clients to complete, which seems to pull out the important things the clients want.” The clients also supplied a scrapbook with ideas & photos and the detailed brief was established in several design meetings. Ole says that for Waiheke it was “a fairly flat site but close to the edge of a steep embankment. The access was good, so site related issues were pretty straightforward”. Their clients wanted a home of around 200sq m with the majority of the living spaces and bedrooms to face the western sea view, and for the home to have high sloping ceilings, clean and contemporary living spaces, and provision for art work to be displayed. An expressive roofing profile was part of the brief, as was contemporary building materials with a selection of cladding surfaces. The clients wanted an easy flow between the interior and the deck areas facing the sea, accessed by all bedrooms, as well as covered porch areas on the east and west elevations to create morning and afternoon outdoor spaces. An outdoor patio off the dining space was to be protected from prevailing southwest wind to provide an alternative entertainment area as well as access to the barbecue and vegetable and herb planters. One bedroom was to be designated as a multi-use office/guestroom/living room extension. Passive solar features including the use of thermal masses were a key element as were efficient space and water heating systems. Two heat pumps service the under-floor heating and the hot water system. Claudia says, “With a need to capture the sea views on the western elevation while optimising the passive solar aspects, a gullwing roof design provided the most desirable solution.” She says Calder Stewart’s Solar Rib was chosen to accentuate the roofline with its “attractive roofing profile offering a strong linear pattern”, with Solar Rib, Photo-Voltaic Laminate (PVL) solar panel technology to be added at a later stage. The clients wanted the house to have a colour scheme sympathetic to the environment and to appear anchored within it.. Concrete slab foundations, concrete block walls, a low deck and courtyard elements help it to feel part of the landscape, while vertical cedar shiplap weatherboards treated in a palette of earthen colours were selected to complement other aspects of the building. Landscaping contrasts with the earth colours of the house. Exterior Titan board is painted in Resene Lumbersider CoolColour tinted to Resene ‘Oilskin’, complemented by Resene Lumbersider CoolColour tinted to Resene ‘Ironsand’ on fascia boards and Resene Lumbersider tinted to Resene ‘Quarter Truffle’ on the fascia lining. The exterior palette is finished with Resene ‘Stonehenge’ on the pergola. The interior colour palette becomes lighter with Resene Zylone Sheen waterborne low sheen tinted to Resene ‘Wan White’ on the walls and ceilings, and doors in Resene Lustacryl semi-gloss waterborne enamel tinted to Resene ‘Triple Sea Fog’. Lapp & Toft Architecture Ltd.
Set up in 2004 by Claudia Lapp and Ole Toft, Lapp & Toft Architecture takes a team approach to all projects, with a commitment to exceeding client expectations on design, service, delivery and quality. “While we provide technical and design expertise, the clients are continuously involved in the journey that is the design process, to ensure a design that satisfies their individual needs”. Claudia has had a lifelong interest in sustainability. She studied architecture in Germany, graduating in 1985. From 1985 to 1992 she worked in different German architectural practices, in each practice her work focused on ecological building/sustainable design. Ole studied Architecture at the University of Auckland, graduating in 2003. Prior to that he worked as a building contractor for 10 years, mostly on residential builds and alterations to villas. Before commencing practice as Lapp & Toft Architecture, he worked for an established architect’s practice.